Fine Motor Development and School Readiness. How can I help my child develop basic pencil and paper skills for school? Pencil and paper continue to be the primary method of written communication in elementary schools. However, outside of school, it is not surprising it is no longer the case. The age of technology has drastically decreased our use of pens and paper. In addition to this, kids, as young as infants, are also using technology, and may miss the exposure and experience to develop those skills. Strong arms and hands begin with strong cores. Before children can learn to hold a pencil properly, they must learn to maintain proper postural and core control and to stabilize their upper body. This is not a skill that necessarily needs to be practiced; babies learn to sit well before they learn to hold a pencil. Nonetheless, if you notice your child consistently leaning over the desk and bending his or her back, or even falling out of their chair, it may indicate that they’re struggling to maintain an upright position. This could simply be due to fatigue and a quick fix is to have your child lie on the floor on their tummy to complete the activity. However, if this is a constant issue, you may want to have your child assessed by an Occupational Therapist. Get them started on developing a strong pincer grasp. Fine motor skills develop from infancy. Most babies will develop a pincer grasp (grasp using the thumb and index) at around 1 year of age (most one-year-old babies, for example, can pickup a cheerio with a pincer grasp). 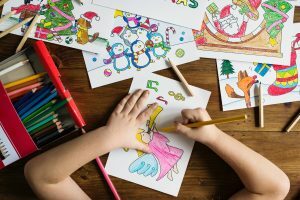 It is important that parents continue to nurture and develop these skills, so that children are ready for pencil and paper activities when they are preschoolers. There are plenty of play-based activities that you can enjoy together like building Lego, completing baby puzzles and colouring or painting. Follow their lead and choose something they will enjoy. You can find hundreds of age-appropriate ideas on Pinterest. Here is a list I often refer to for ideas. Let them get creative, and practice their pre-printing skills with them. By age four, most children will be able to copy some basic shapes like a cross, a circle, and lines (vertical and horizontal). Most children will also be able to draw a simple stick figure with three different body parts. By age five, most kids will be able to draw more complex shapes like squares, X’s and triangles independently, and put shapes together to draw an object like a house or a tree. These skills are so important to build prior to learning to print (hence, why we call them pre-printing skills). But in order to build these skills, children need sufficient exposure to those activities when they are toddlers. Toddlers can develop those skills by simply drawing and colouring with their parents. Your child will likely imitate you and try to copy what they see you doing. Remember, exposure and consistency are key! Fine motor skills often develop naturally provided kids are exposed to age-appropriate activities when they are younger. Some children show no interest in crafts as toddlers, and parents have difficulty engaging their children in fine motor play. Other children develop fine motor delays secondary to other developmental issues, such as being identified on the Autism Spectrum. If you are struggling with your child’s fine motor skills or written output skills, an OT can help comprehensively assess your child and provide the appropriate recommendations. “Why won’t my toddler eat? !” Three tips to establish positive feeding habits in your home. Three Strategies to Help Kids with Messy Writing. 4 Things You Should Know to End Feeding Battles with Your Resistant Toddler. The Sensory Child…How Sensory Processing Disorder Affects Daily Functioning. “Is My Baby Ready for Solids” Three Signs Your Baby is Ready for Food.